Since 1982, Paul has written his popular column for the Seattle Times Sunday magazine. We will be archiving them here, starting with a handful of more recent contributions and continuing to add more as time and effort permit. Several elements ensure this will be an intriguing feature of our blog. First, clicking on the photos will provide viewers with a much larger size than the Times can accommodate. Delight (and perhaps, the devil) can be found in the details. Second, we will post our ‘Now’ photos in color. Lastly, it allows us to swing the camera around and show wider and alternative shots from different perspectives. Please see the beginnings of a dated list to the right and below. 2017-01-21 The Butler (Hotel) Did It! Frank Jeffry Clancy, M. D., who practiced there in the 1920s? Paul may have already emailed you, and I’m sure he has wonderful historical shots of the building you’re looking for. If not, or in the meantime, try this link to a recent photo I took of it (http://bythedarkofthemoon.files.wordpress.com/2010/05/yesler_bldg_big_o.jpg) I believe this is your building. I never heard that it was a hospital. It would be interesting to read what Paul knows about it. I am hoping to answer your question about the car in the lower left corner of the Then photograph. It may be a Queen. I have a picture of a 1909 Queen which I took last summer. It resembles the car in the photo. I could email it to you if you are interested. Your feature in Pacific Northwest is a highlight of my week. Thank you. Those were great times. Thanks for bringing it all back with your writing. Thank you for the Then and Now series, my familys has been in Seattle over a 100 yrs and in the 1st Then and Now book is a photo of my Grandfathers grocery store in the Roosevelt district, he sold the store and started his carpenter business, he built several homes and business’s around Greenlake, he started building the family home in 1904 and completed it in 1914 where seven children were raised, I love the history of Seattle and the Then and Now series gives a photo of City which I really enjoy. THEN (1940): why do we not see the semi-circle turn-out that was part of the I90 floating bridge in the 60’s and 70’s?? I was fascinated by your documentation of the 1912 Baist’s Real Estate Atlas in this morning’s Seattle Times Pacific Northwest magazine, but when trying to access the web site given at the end of the article, my browser says, “You do not have the authority to access this site”. How can I see the maps online? Thanks. I am looking for photos of Admiral Junction in the 40’s and 50’s. I am specifically interested in Tony’s Market (vegetable stand), the meat market next door to Storr’s grocery, and further north, Mr. Carroll’s drugstore (an antique store is now in that building) and the grocery store attached. I was raised on Palm Avenue and our home is still there (1602). I hope you can direct me to these photographs. I’m a frequent reader of your Now & Then feature. I’m always curious about what appears to be a coal fired power plant a block or so inland from Coleman Dock. While it is not an architectual wonder, it certainly has stood the test of time. Have you ever given any history on this facility? I second Greg’s query. I walk by there a lot and I experience a cat-like impulse to slink in there and look around. The place is still being used for something. What are they doing in there? I’m wondering if there is any documentation of people who dove off the Fremont Bridge for fun back in 1921. My mother, then 16, and her diving instructor ‘Black Jack’ dove off of there in the summer of 1921. I have pictures of them both at the time but not in the dive. I remember mother saying her bathing caap split right in two! They had trained at the Coleman Pool. 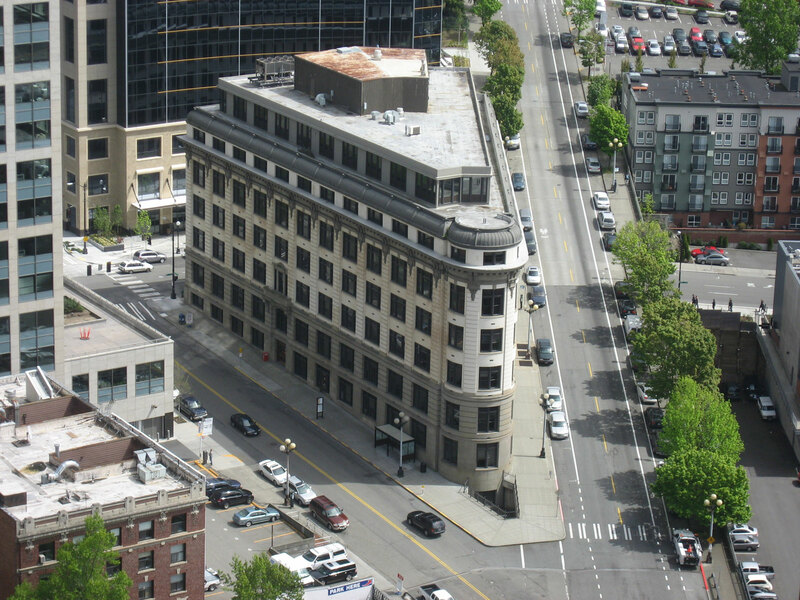 What was the original purpose or use of the garage looking building @ the Southwest corner of 2nd & Washington? It’s all boarded up now but looks to have once been an impressive building. Paul & Jean – I enjoy your “Now & Then” pictures and articles in the Pacific Northwest section of the Seattle Times. I have a photo taken in downtown Seattle in 1950. I am not sure of the location and would like to find out so I can do a current picture of the location. My grandparents, my uncle and I are in the picture. I am the only one who is still living. I was 5 years old in the picture. Can you tell me how I might identify the location of the picture. It was in front of a movie theatre. Thanks. I always enjoy and appreciate photos and stories about Woodland Park – thank you. I’ve often wondered about the decision to put Aurora Ave through the middle of the park. Was there much civic debate about it? Did they consider tunneling underneath or choosing a different pathway (perhaps through Ballard?) instead of cutting through? I can’t help but wonder how they decided to slice up such a beautiful part of the city for the sake of traffic. Thanks for any insight you might be able to provide. I found in my year old husbands, grandfathers desk who lived in Hanford, a tin box that looks like it could have been maybe a stamp pad? It is the size of a sheet of paper and when you open it, it has inside a sponge like material and is very wet and like ink. It is very old and rusty. The outside is rusty but you can read that it says Lowman and Hanford Seattle Wa and Lithograph. We were just curious if you could tell us what it is or was used for. Thank you in advance if you can give us some info. Just found John Carter’s post (below). In early ’70’s I fell in love with a wonderful young woman, Barbara Johson, who had moved onto the adjacent dock at 2339 Fairview Ave. We shared my houseboat next to Meryl’s for several years until we moved to our current location in the Haller Lake neighborhood, the site of my late teens and early ’20s, and where we now live in the cottage my dad and I built in 1951. Our twins, now 25, are thriving in DC and Brooklyn and visit occasionally. I’m still in intermittent touch with most of the others (Bob Hosko and Paul Post passed many years ago), I saw Donnia Post and Ann Dawson,last year; Mark a few years ago; Steven about 40 years ago just before he disappeared into monkdom, . Contact me at RickBarrett@gmail.com, be happy to visit. OMG! I typoed Barbara Johnson’s name. Please note that Seattle’s old Pier 51 location is now the Seattle/Bremerton ferry dock, NOT the Seattle/Vashon ferry dock. Please go correct your error. I don’t know whether you can give me the email address of Dianne Wheless Thorniley in one of your responses to Now and Then but she indicated that she grew up at 1602 Palm Ave in West Seattle. I just happened to grow up at 1610 Palm Ave and it would be very interesting to contact her. Thanks for any help you might give to me. I seem to remember an older, pre-Space Needle, Seattle City Logo consisting of an orobouros (serpent eating its own tail) … or was I just on a bad acid trip. The Indian head logo is a recent appeasement to Native Americans just like King County’s logo change from a crown to MLK’s profile, and the renaming of Empire Way South to Martin Luther King, Jr. Way South was an appeasement to the denizens of the “Central District”. I think appeasement is recism on steroids … what do you think Paul? I was recently found a faded copy of a “Now & Then” titled “Licton Park Home”. It was a great piece on the Licton home of David Denny that is still there. However, when I went through your archives, I could not find it? I have “Seattle Now & Then, Vol. 1,” but could not find it in there either. Where can I find this Now & Then about the former David Denny vacation home (and permanent home after the Panic of 1893)? Paul: First, a thank you. I so enjoy reading your story every Sunday in the Times. It’s the first thing I look for. Second, a question. What is the history behind the little stone house at the East entrance to the Arboretum? I have lived in Seattle since 1951, and can remember my parents driving us kids by that little stone house on Sunday drives. As a small child, I was always somewhat scared and wondered if an old troll lived there. You know what I mean. Anyway, what’s inside and is it used for anything these days. I assume it was originally a caretaker’s house. Thanks. Hi Paul, I am working on putting together a photo book about Seattle radio history. It will be published by Arcadia Publishing Co. early next year. I am currently on a hunt for photos of early radio broadcasting in the Puget Sound area. Can you help by providing some images from your vast collection? Maybe your readers can help. Thanks in advance. Paul – when I first moved here 21 years ago I used your notes and pictures of Seattle then and now to learn about local folklore and history. I am a civil engineer and came across this from an ASCE article. Check out the sink hold on in Revena in 1957 (year I was born). Hi Paul! Hope you are well. The Ward House is well! I need a forensic historian (other?) to find an old Rainier Beer poster (ca 1970-75?) that has a class mate of mine *(Chris Kirk) in it along with a nice picture of Mt. Rainier superimposed on his (bald) head. It was a billboard and displayed elsewhere. We are having our 50th Lake Washington HS reunion and he cannot make the trip from Boston. We would like to get an image. Any ideas? Thanks in advance. Come visit the Ward House when you are next up here. I may retire soon (pushing 70) and sell it. Ughh. I’m hoping you have in your possession — or know where I can find — a photo from the 1930s of the Sunset Boarding House at 725 9th Ave — kitty corner from St James Cathedral, and now occupied by Skyline Senior Living. It was run — in large part for the soldiers and sailors of the area — by Ella Lindsay, my grandmother, and I remember at age 2-3 learning the language of “those boys,” and having to move to QA Hill with my parents then! My parents met there, were married down the hill a block or two at Plymouth Congregational Church, and returned afterwards for a grand feast in the boarding house dining room. The front bulkhead was similar to that across the street now at that address, and the entryway was flanked by two stone lions. The second story had a widow’s walk around it for gorgeous views — similar to today. I would so cherish seeing it in its modest glory, after hearing so much about it from my family — the breadline that formed each evening after the cook Mrs Mac cleaned up and doled out the scraps . . .the enormous linen closet that held all the mangled bed sheets . . . the way it absorbed and took care of our own down-and-out extended family members after the Depression. Where can you lead me to find an image of it? Hi – I’m exploring the Green Lake neighborhood with my 6th grade Geography class. Our school (Billings Middle School) is in the old Green Lake Funeral Home building at the corner of Woodlawn and Maple Leaf. I am looking for photos of the old building and history on the place. Any ideas? My name is Sonja Lowe. I spoke to you this afternoon regarding your historic photo of the building on the corner of Palantine Ave and N 85th Street. I hope this information is helpful. Thank you so much for the work you do to highlight our city’s history! Was wondering if you guys had thought of researching the historical photo archive, to see if you could find any large metal objects where Bertha is stuck? Might be a great find for Then & Now, and benefit the tunneling operation too. Always read and view Now and Then in the Seattle Times. Good Morning, I had a telephone conversation with Paul about 1 month ago. He had borrowed a photo of mine years ago at a meeting of the Women’s Century Club. He has the photo of Ballard corner of 65th and 15th N.W. The photo is taken from the porch of a house that was on the southwest corner. It shows 2 adults (one holding a toddler) with a push lawn mover and an empty field behind them where Ballard High School will be built. Paul said he was able to work with the photo and improve the clarity and that he would email that improved photo to me. If you could forward this message to Paul I know he will communicate with me and email me the photo. Thank you so much for your help in this manner. See this article about photos being destroyed in Richland, WA. Hi Paul—what a wonderful tribute you put together for Paul Heald’s celebration of life. Good to see you there. I have a question about how to find the original plans for my house in Ravenna built in 1914, area called “Thompson’s University Addition”?—can you direct me to a resource? I have a copy of a document that looks like the one you have posted for the Brooklyn house around the first WW. I read your article with interest on “Songbird sings at the former home of long-gone Frances Hotel” in Pacific NW on August 23, 2015. It wasn’t until the end of the story that I realized you were talking about Dose (not pronounced dose as in dosage from a drug store like I was saying to myself, but Dohcee). The Doce mansion was one house away from the home I grew up in on 32nd Ave. S. In fact, we always thought that the four car garage that we shared with our neighbors had at one time belonged to the Doce house. In the early 50’s when I used to walk down Doce Terrace to the steps to Mt. Baker Park to go swimming, I often stopped and talked to Mrs. Doce when she was in her yard gardening. At that time she lived in the last house on the right hand side of Doce Terrace right before the steps that go down to the park. I realize from your article that she must have been C.C. Doce’s widow. She may have been in her eighties then and told fabulous stories about the “old days” such as taking the trolley to Columbia City and/or Hillman City to go to quilting bees – sometimes an overnight affair. Thank you, Paul, for the happy memories you give us and for filling in the gaps. Now & Then is one of my favorite reads on Sunday. I love sharing these with my friends and family. The latest post of 1st Ave/Seneca St you can see the Galland Building 1221 2nd Ave. Amazing how close to the water front when you look at the really old Then photos. I, too, love those columns every Sunday. Being a 4th generation Seattleite, it’s interesting and sometimes sad to see the changes. I am interested in anything about my great grandfather who had a team of 2 horses and wagon he used taking people from trains and ships to their destinations in town and back again, also for hauling anything he could including helping with the Denny Regrade. His team was a light and a dark colored horse and whenever I spot that combo in old photos, I wonder if that is his rig. His name was Curtis Scripture. I remember well watching the 1974 Polson Bldg. fire from the Sea First Bldg. Subsequently spent 39 years as a tenant of the nearby Maritime Bldg. which had a lot of interesting tenants before it’s closure and current renovation. It would make for a great article too. I am trying to find any information on my great grandfather who had a 2 horse team and wagon in the early 1900s in Seattle. Hauling anything he could for a living, people or “stuff”. Any old picture I see I look for the white and dark horses as his team was and hope to identify him and writing on the side of his wagon. Or anything on Curtis Scripture. If you have anything that would identify him and his wagon, I’d appreciate it. thank you for your response. I didn’t think to check this site for answers. Was hoping for an e-mail from Dorpat, but glad to hear from you anyway.